by Janet Lane, Director, Human Capital Centre, Canada West Foundation, and T. Scott Murray, Principal, DataAngel Policy Research Inc.
A significant proportion of Canada’s youth have poor literacy and numeracy skills. This is bad news for them, for employers and for our economy. These skills still matter. Level 3 literacy, the level at which readers begin to analyze, evaluate and apply what they have read in new and different situations and to easily problem-solve, is needed to perform well in every new job that is being created. What’s more, literacy and numeracy are the core “learning to learn” skills, and more than ever, our young people will need to keep learning to keep pace with the changing world of work. 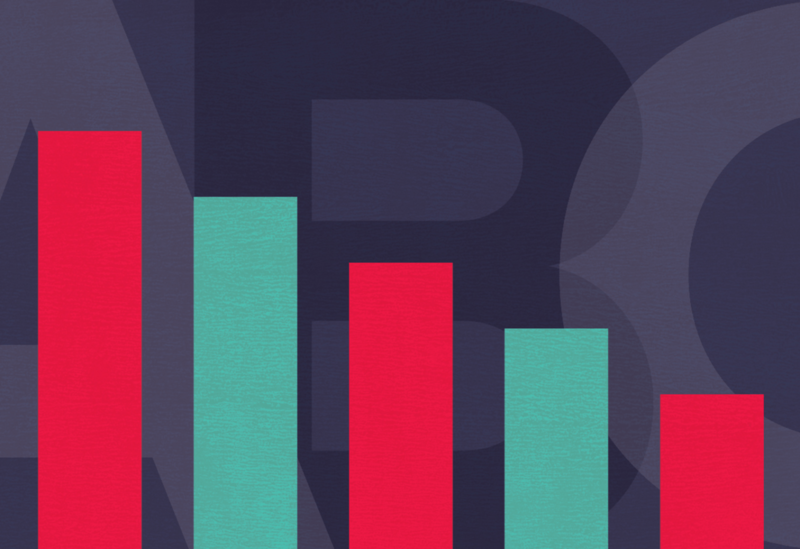 Building basic skills is the mandate of the K-12 system, but despite rising high school graduation rates, average literacy and numeracy scores of Canada’s high school aged youth are actually declining. The solution must begin here. More immediate results would be realized if the literacy and numeracy skills of the more than 80 per cent of youth who attend post-secondary education were assessed and, where necessary, boosted, upon entry to their post-secondary institutions. This would guarantee that graduates have these essential skills and would have the added benefit of ensuring students get more out of their expensive education. Finally, there is a need to embed these fundamental skills into any workplace training, including orientation training offered as new graduates begin their careers. First the good news. Driven mostly by the higher high school graduation and post-secondary education participation rates of the youngest cohorts, the educational attainment of the adult population aged 16 – 65 increased, on average, by a whole year between 2003 and 2011, and has continued to rise.1 More working-aged people have earned a high school diploma (88 per cent in 2010) and the proportion of people who had graduated from post-secondary studies increased by 20 per cent between 2000 and 2010, to 50 per cent. Now the bad news: A large proportion of Canada’s youth have low or poor literacy and numeracy skills. Increased educational attainment is not increasing their average literacy and numeracy scores at the expected rate. Instead, scores are falling. 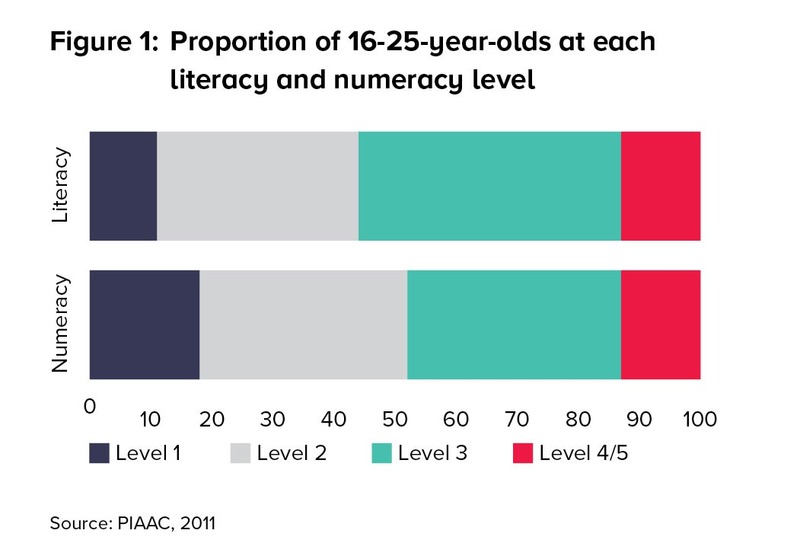 Figure 1 shows the proportion of youth at the different literacy and numeracy levels. The reality is that 44 per cent of youth, many of whom are in PSE programs, do not have the literacy skills they need to learn efficiently. Their basic numeracy skills are even worse – over half of them have low or poor levels of numeracy skill. They have likely taken at least a Grade 10 math course but may not be able to figure out what “30 per cent off” will mean at the cash register. Note: This data comes from the OECD’s International Adult Literacy and Skills Survey (IALSS, 2003) and Programme of International Assessment of Adult Competencies (PIAAC, 2011). Literacy, numeracy skills are assessed on 500-point scales, divided into five levels. The data from the two studies have been placed on the same scales for comparative purposes. Meanwhile, recent Programme for International Student Assessment (PISA) scores show that average reading and math scores have generally been falling in 15-year-olds (Figure 2). 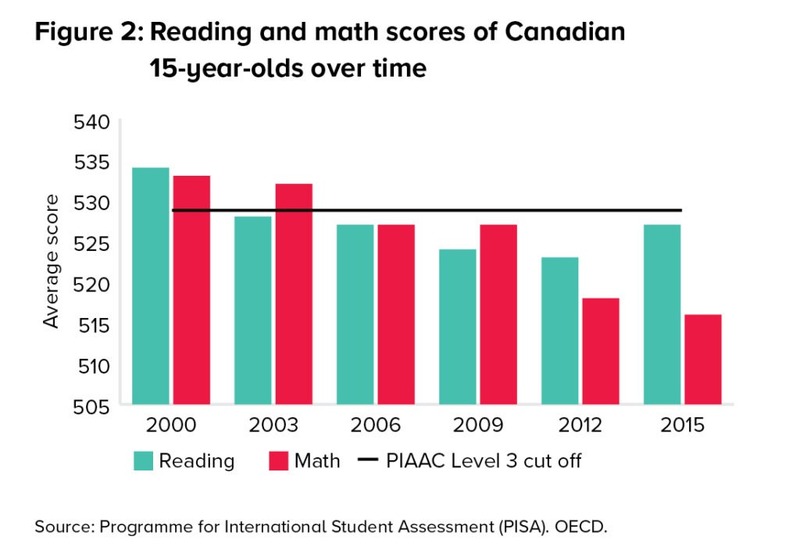 Average reading and math scores at age 15 now fall beneath the OECD’s PIAAC Level 3 cut-off (equivalent to 529 points on the 800-point PISA scale). It’s unlikely that lower youth reading and math scores are a temporary aberration, that the students in high school now are being better prepared and that adult literacy and numeracy scores will, left to themselves, improve. While the figure also shows that typically 26-35-year-olds have higher scores than 16-25-year-olds, both age groups had lower average scores in 2011 than in 2003. Further analysis of the data reveals that, on average, the people who were in the 16-25-year-old cohort in 2003 did not gain more skill by 2011, when most of them were in the 26-35-year-old cohort, despite many of them still being in post-secondary studies. 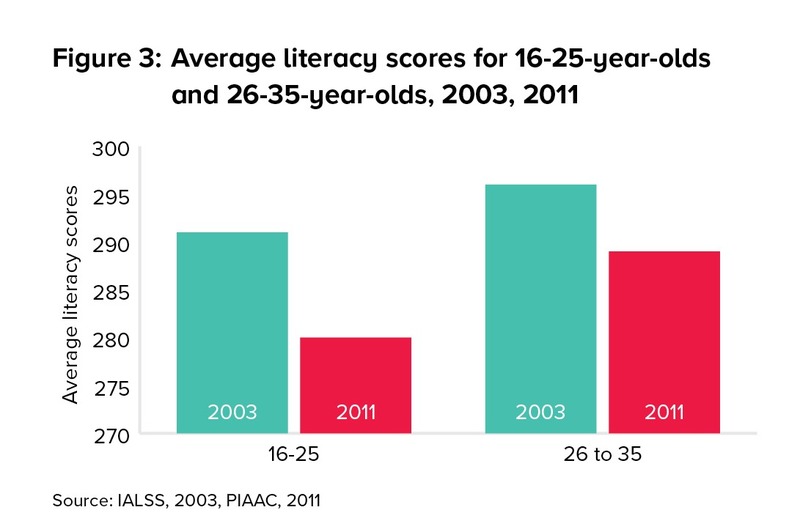 Recently, post-secondary education has not increased literacy skills as it did in the past. Analysis of the IALSS and PIAAC studies reveals more. Table 1 shows that average literacy scores go up with each level of educational attainment, but in 2011 compared to 2003, literacy scores were lower at all levels of educational attainment save the small number of youth without a high school diploma. Except for graduate degree levels, they were lower by at least 10 points. Table 1 also shows that high-school and post-secondary education below the degree level are not increasing literacy skills as much as they did in the past. Poor fundamental skills cost us all: the students who struggle to learn and perhaps leave their programs – even though they have dreamed of a career in that field; the parents who support their children and hate to see them fail and their education savings disappear; the employers who hire people who do not have what it takes to do their jobs well; the economy that lags in growth and productivity; and, the taxpayers whose money is not well spent. The authors have made previous recommendations for improving average literacy skills of the Canadian workforce, which were documented in Literacy Lost: Canada’s basic skills shortfall, and The Literacy Hustle published by Canada West Foundation (see both at cwf.ca). These recommendations still stand. Assess the skills of incoming post-secondary students – perhaps upon acceptance to their programs – and encourage those with poor levels of literacy and numeracy to improve their skills before they begin their post-secondary studies. A variety of options for assessment and upskilling are available through online learning platforms and applications. Campus learning centres should also offer opportunities to improve these skills. The earlier students upgrade their skills, the more they will get from their efforts to learn new material. Governments, who have a responsibility to provide basic education, would see benefits that far outweigh the costs of supporting this measure. If governments do not fund it, post-secondary institutions that provide both assessment and upgrading will gain a competitive advantage – their graduates will be more employable. Previous analysis has shown that each point of literacy gained earns $61 per year.13 Upgrading skills by 20 points on the PIAAC scale, enough to put the majority of students over the Level 3 cut-off, would first make their learning in PSE more efficient and then, among other benefits, increase their earnings by $1,220 per year, every year they are employed. This intervention would increase the basic skills of the majority of people entering Canada’s workforce. Statistics Canada numbers show that 531,633 students received a certificate, diploma or degree from a post-secondary institution in 2016. Others entered the workforce straight from high school or without finishing their PSE studies. If all of the new entrants to the workforce every year had adequate levels of literacy and numeracy, over time the economy would see a significant boost to productivity and GDP, skill-based wage and income inequality would fall, literacy skill loss on the job would also fall, and taxpayers would get a higher return on their investment in postsecondary education. 7 Alex Usher, Higher Education Strategy Associates.